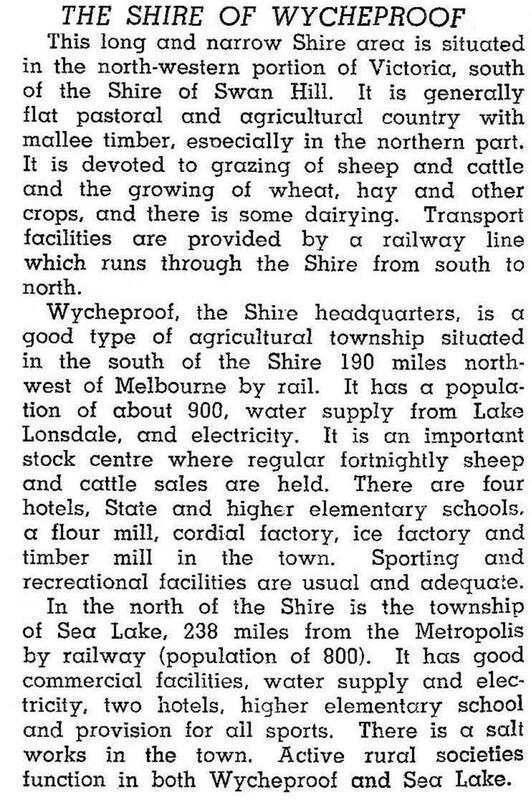 Wycheproof Shire (1894-1995) was created on 27 April 1894, by the severance of the North Riding from St Arnaud shire. It was named after the Mount Wycheproof and the town of Wycheproof, which is overlooked by the mount. The town was the shire’s administrative centre. The mount is a mere 43 metres from base to summit, and is situated in an area of flat to undulating land, originally covered with Mallee growth. Subdivision of the area into farms, mainly during the 1890s, converted it into a cereal growing district. Water channels from the Grampians storages and from the Western Waranga system brought water for livestock. Access came via the Wycheproof-Sea Lake railway (1895), paralleling the Calder Highway, running north-westerly through the middle of the shire. At the north of the former shire, near Sea Lake, is Lake Tyrrell, into which empties Tyrrell Creek, the main natural water course. The Lalbert Creek, along the shire’s eastern boundary, similarly empties into an inland lake. Most of the former shire’s settlements are on the railway line: Wycheproof, Nullawil, Culgoa, Berriwillock, Sea Lake and Nandaly. Wycheproof shire’s area underwent several adjustments with adjoining shires, ending with 4110 sq km (1949). In 1994 farming occupied 89% of the shire’s area, carrying 202,300 sheep and lambs and 3840 meat cattle. Wheat amounting to 151,000 tonnes, and barley amounting to 121,900 tonnes, were harvested. On 20 January 1995, Wycheproof shire was united with Birchip and Charlton shires, most of Donald shire and part of Kara Kara shire to form Buloke shire. The new shire’s administrative centre is Wycheproof.